At the top of any conversation, you'll have the option to go back to the list you were looking at, which may be the Team Inbox, or any of your other folders. You'll also have the option to jump to the previous or next conversation in the list. On the right hand side of any conversation, you'll see details about user, along with options to follow or mute, and a list of any other conversations. Profile image: The profile image of the user will be displayed. Follow user: Follow or unfollow a Twitter user. Mute user: Mute a user if you'd like to automatically send future conversations from them to the Spam folder. Public data: Public data such as a link to their social account (currently only available for Twitter and Instagram), their location (if known), any websites they're linking to, and their bio. Help Scout: If your Reply account is integrated with Help Scout Docs, a link to Help Scout will be displayed. Clicking on this link will take you to Help Scout Search, with the user's name already queried. Other conversations: Other conversations with the user will be listed on the left hand side, which you can click on to view. Learn more about when conversations are split here. 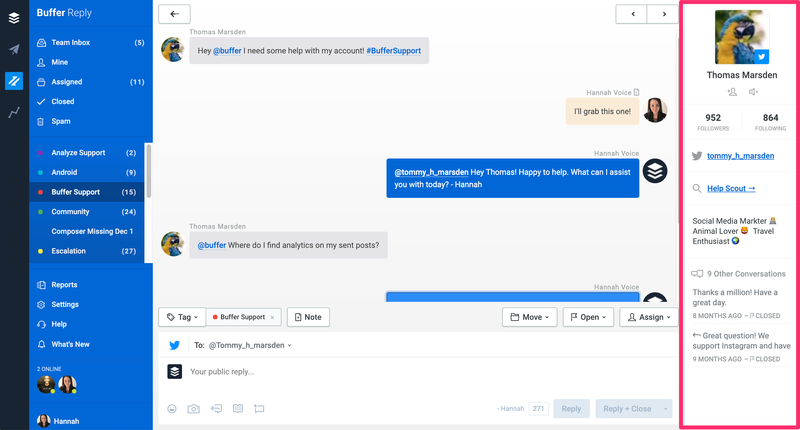 Within the main area of the conversation view, you'll see all threads between the user and your team. Messages from users will be shown in grey and displayed on the left hand side, while replies from your team will be shown in blue and displayed in the right hand side. Internal notes added by team members will be shown in yellow, also on the right hand side. Tag: Add unlimited tags to the conversation. Note: Add an internal note. Only team members will see notes. Move: Move the conversation to the Team Inbox, Spam folder, or any custom folder. Status: Change the status between Open, Pending and Closed. Assign: Assign the conversation to another team member. Insert emoji: Choose an emoji to accompany your reply. Attach an image: Upload an image to include with your reply. Insert Saved Reply: Saved Replies are pre-created responses that your team can use within their replies. Insert Help Scout Article: If your Reply account is integrated with Help Scout Docs, you can choose an article to include with your reply. Include Direct Message link: Choose this option if you'd like to prompt the user to send you a DM. This option is only available if you're responding to a public Tweet. Reply: Send your reply and don't change the status. Reply + Close: Send your reply and set the status to Closed. Reply + Pending: Send your reply and set the status to Pending. 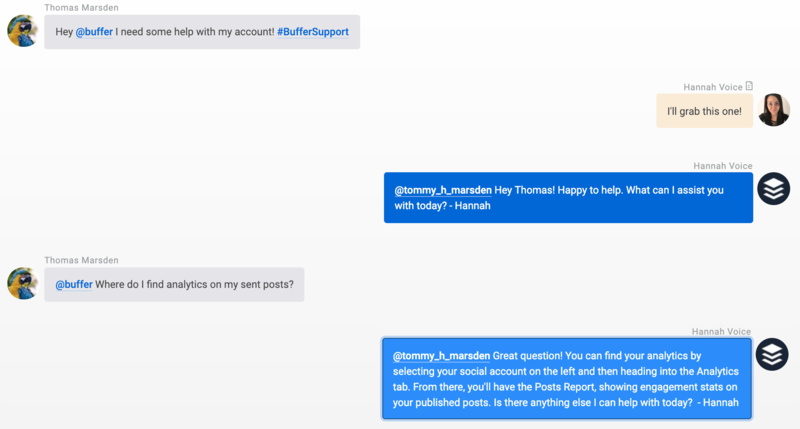 Reply + Close + Assign to Me: Send your reply, set the status to Closed, and assign the conversation to yourself. There is also a default option for this setting, which you can enable by heading to Settings > Account. In all cases, you will have a 10 second window after sending the reply, in order to retract it. Simply hit Undo at the top right of your screen.